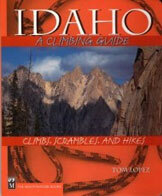 “What shall we climb?” is a loaded question for us. Its kind of like “to be or not to be?” for poor old Hamlet. There are two many options, too many summits. We talk about the options and then agonize about the decision because time is so limited. Monday and Tuesday. Work, work, work. At home its chores. At lunch its running. 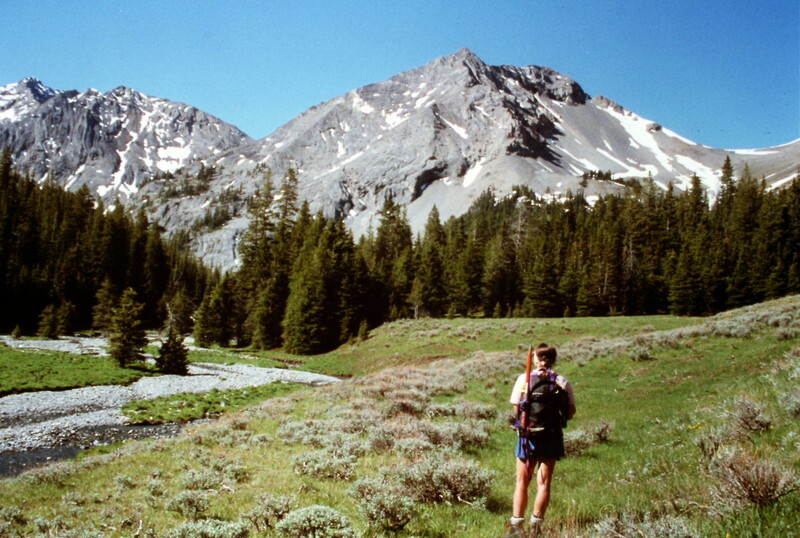 In between we pick a peak: The north face of USGS Peak in the Lost River Range. To our knowledge the face has never been climbed. Its one of those peaks that has haunted us for a long time. Three earlier attempts on the peak over the last fifteen years came up short. One brief is finished. Wednesday. Usually, Wednesday evening is the drop dead date for packing and planning. We must collect the maps, pick the route, pack the packs, buy the food because we will be too tired on Thursday. Brief number two is done by 4:30 PM. Thursday. Its time to finish the third brief and draft an outline for the Monday morning hearing. A new case comes in and I find an Answer is due by today. Between witnesses and opposing counsel to much time is spent on the phone. I run a lunch time. A case settles, gotta draft a release, oops, time to go home. At home the garden needs water, the equipment needs checking. We look at the maps and go to bed. Friday. 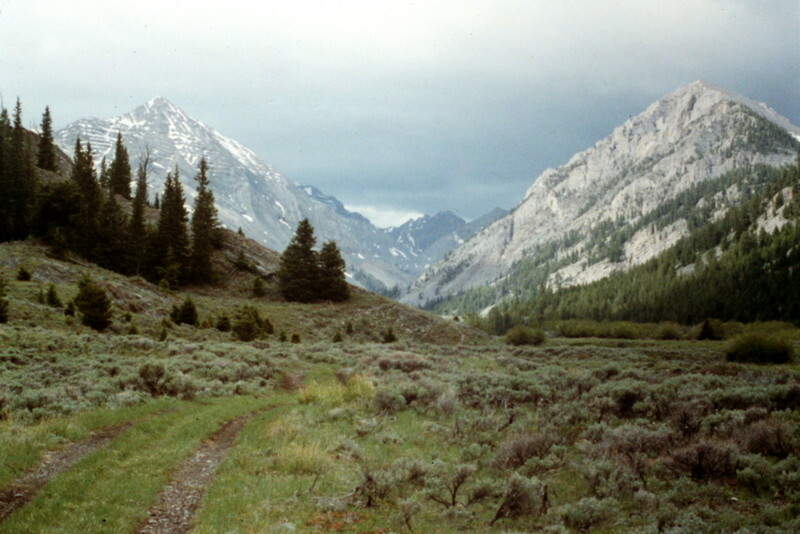 The drive to the east side of the Lost River Range will take at least five hours, so we plan our escape for the early afternoon. The third brief is done. At 3:15 we are in the truck and heading for the freeway. From Boise we drive east to Bliss, Shoshone and Arco. Lava fields and small towns pass by and the mountains to the north and east grow closer. At Arco we buy gas and drive east to Howe. Its 6:00 p.m. and we are pointed north on Pahsimerio Highway. The good roads end at Clyde. We follow the Wet Creek Road west to the Dry Creek cut-off road which runs northwest. About 6:45 PM we arrive at the shattered Dry Creek dam which was (according to one story) blown up as a result of a water rights dispute in the 1920s. We stop for a break. The most difficult four miles and hour of the drive are ahead. The sun is dipping down behind the mountain crest. The shadows bring a coolness. The road down from the top of the dam is reminiscent of a roller coaster ride. One turn, is nothing more than a talus slope which pitches out and sharply down at a wicked angle. The Jeep bounces and stammers, the wheels throw gravel and its over. I release my death grip on the steering wheel. Its now time to ford Long Lost Creek for the first time. The creek is wider than I remember, but we plunge in anyway, making waves with our bumper. The gravel stream bed supports us and we cross without incident. Its starting to get dark. In another mile we cross the creek again. A quarter mile further and we reach a grassy, water logged meadow. The stream has divided into numerous rivulets which liquify the earth. No cell phone will reach a tow truck from this remote spot. We have visions of the truck sinking into the meadow and tired of driving, consider setting up camp without crossing the meadow. Realizing if we do not continue, we will have a much longer climb the next day, we go on. Mud oozes and water sloshes around the truck. We creep from one mud hole to the next, finally reaching the mother of all mud holes. “What do you think?” Dana asks. “Some one drove through here,” I say without much confidence. We explore the mud hole on foot, it has a bottom, and we drive on. Suddenly, its over. There is dry ground under us. The road is now surprisingly good and the last bit goes quickly. We have made it, the proverbial end of the road. The Long Lost Valley is a difficult place to reach but well worth the effort. Time to make camp in the twilight. The tent goes up, the sleeping bags are unpacked the headlamps and novels are thrown in the tent, water is located, a late night snack is gobbled up and suddenly its quiet. 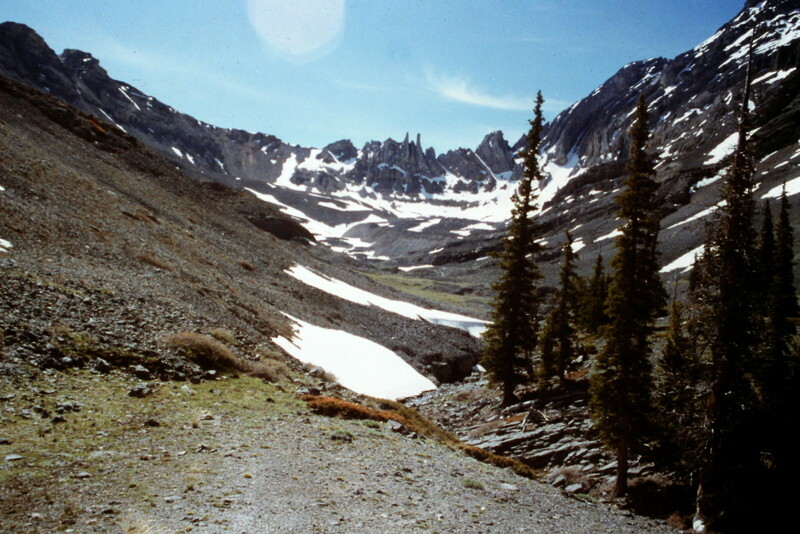 Massacre Mountain, a long hulking ridge, towers above one side of the valley while the canyon walls on the other side of the creek climb to the summits of several unnamed peaks. A deer crosses the meadow. The wind shifts slightly and the sound of the creek rolling down the canyon reaches our ears. Its cool now. The trees sway with the breeze and I fall asleep while my untouched novel lays at my side. Saturday. Well OK, not the crack of dawn but a respectable 7:30 AM. Time for a quick breakfast, then we load the packs. 8:10 a.m. and were on the trail, an old trail, that has seen little use in the last 25 years. We hike through stretches of fir and pine separated by sagebrush covered flats toward the headwall at the end of the canyon. The trail has disappears. As the route climbs up a steep slope through an avalanche run my legs remind me its going to be a long day. After the road ends there is a sketchy trail that can be followed in places. It is for the most part missing in the meadows but locatable in the trees. A short distance ahead we encounter a 100 foot water fall dropping over vertical rock walls. Following the stream is out of the question. We located a route and start up the side of the canyon. The detour involves climbing 200 feet up a steep, dusty slope. From this point a 75 foot loss in elevation brings us back down to the stream above the waterfall. The next obstacles, two smaller waterfalls, are not as time consuming to bypass. An hour has gone by. 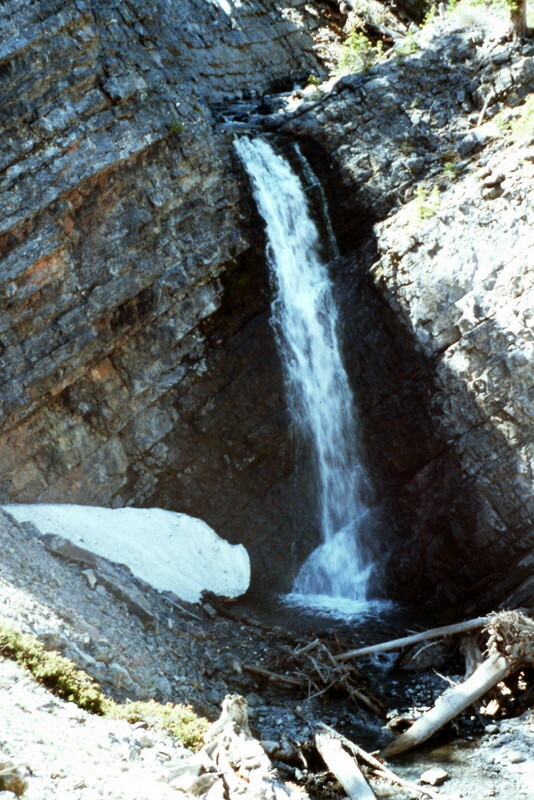 The highest water fall along the approach route. A detour around a fourth water fall brings us to a spot where the valley opens up into a hanging valley. A small tributary stream flows down slope from a side canyon, tumbling out of a long snow slope. Our route climbs up this slope to the cirque above. Do we get out our ice axes and crampons to climb the snow or do we climb the rocks to the left. Decisions, decisions. We opt for the rocks to save time. The slope is at least 300 feet high (100 feet higher than the Capital’s dome in Boise) and it takes us nearly 30 minutes to negotiate our way to its top. Above the waterfalls the valley opens up into a spectacular high valley. One hundred yards farther and we reach a small pond fed by melting snow. A thin glaze of ice covers its surface, a sure sign that the elevation is well over 10,000 feet. From the pond we catch our first glimpse of the north face of USGS Peak. The face is steep, we knew it would be, but wow, it really looks steep. Slender snow ramps climb up the shadow covered face. We snap a couple of photos and look at the wall through a monocular. Dana suggests a possible route. We discuss it. I give it my benediction, “Yes, it will go,” meaning that there are no obvious obstacles and what we see ahead of us does not scare me. 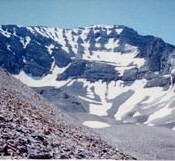 The North Face of USGS Peak. The intervening terrain is strewn with boulders and patches of snow. Although we picked the easiest route across the broken surface it still takes twenty minutes to arrive at the face. Its now time to unpack the ice axes and crampons and to decide whether a rope is necessary. The 1500 foot slope above us rises at about 45 degrees. We opt for speed and leave the rope. Our ice tools are our only protection. The first pitch is 200 feet high, steep and the snow covering it is still rock hard in the morning shadows. At times we hit water ice and neither the points of our crampons or the pick on our ice axes will make a dent. We use our ice axes to cut several steps across the ice and soon reach a rock buttress. Rather than remove our crampons we climb up with our crampons clinking and scraping on the rocks. The footing is good and we scramble up the rock to the base of a snow shute that climbs to the summit ridge, another thousand feet above. Another hour has passed. “It looks good.” We are now 500 feet up the slope and the base of the cirque is spread out below us like the view from an airplane. The tops of the ridges that enclose the cirque are nearly level with us, but the summit ridge seems no closer than it was 30 minutes earlier. We use our axes to cut a small platform and sit down to rest. The snow has varied in quality as we climbed, from “Styrofoam like,” to water ice, to unconsolidated, rotten snow where we have fallen through the crust to our waists. Anything that gets loose on the slope will end up in the rocks 500 feet below in no time at all. We continue cutting steps across water ice. Our quadriceps ache, our calves cramp but we go on. We reach a rock band which constricts the snow shoot and climb on to it for a change of pace. The rock quickly becomes to steep and we move back onto the snow. I’m counting my steps now to take my mind off of my weariness. I set a goal. I’ll try to go on 200 steps before I rest. I make it to 247. Time to cut more steps. Dana takes the lead. Each blow from the ice ax sends a cascade of ice down the slope. The air is completely still except for our labored breathing. Above the water ice, the slope moderates and the summit ridge cuts the sky. Another 15 minutes and we are on the summit ridge. The summit ridge is narrow but easy walking and we soon reach the top. A small register in a can records only the name of Rick Bauger of Idaho Falls who climbed the peak from the south one year earlier. We snack, enjoy the view, discuss other possible routes on the peak and drift into our own little words. The wind picks, reminding us its time to go down. We both know the descent is probably more dangerous than the climb up. We say nothing. We’ve climbed together for nearly twenty years and safety concerns are communicated non verbally. Two hours later we are back in camp. Sunday. Sunday we follow a trail to a near by lake and hike to the top of the high point above it. Its a nice change from the icy north face but its anticlimactic. We still have the return hike, the swampy meadow, two river crossings, a talus slope and a five hour drive ahead of us. We decide to start for home. The next trip must be planned and some now, we have to get our heads back into our work.